Our biggest foe moving ahead is not the right-wing nor the Tea Baggers. Our biggest battle will be from the folks supposedly on our side who love to preface their statements with " I supported Obama....BUT...." 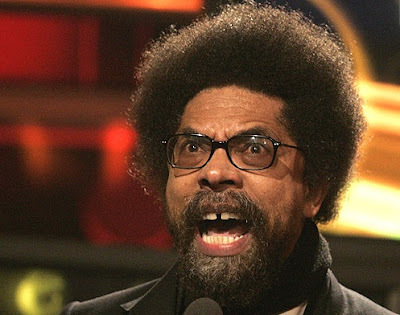 This includes the pro-lefties....the whacky so-called Progressives (many of whom generate donations through being anti-Obama)...then there's the 'super Blacks' like Cornel West, Tavis Smiley and others...all of whom feel a need to 'teach Obama a lesson' through their whining and de-energizing of support. In the November midterms we should have learned the power of de-energizing, as we experienced the biggest beat-down in modern day political history....NOT because the Right ran such competent campaigns....but simply because Dems DID NOT show up to vote. As some justify the ignorance and self-destructiveness of these types....while labeling others as uninformed...please be aware that in 2012 there are a number of Senate seats up for grabs. With the already announced retirements of a number of Dem Senators, combined with the possible Dem de-energizing from the self-destructives like West, whacky Progressives and the like...the FACT is....we could definitely lose the Senate in 2012 (just as we lost the House and multiple states in the midterms). And I must also remind all that the loss of many states like Ohio and others will make winning the Presidential re-election a major uphill battle regardless who or how incompetent the republican candidate is...due to the electoral map (votes)....therefore ALL self-destructive, de-energizing, ignorant rhetoric needs to be addressed, labeled as such and SHUT DOWN.....or we could all wake up....in shock...the day after the next election saying in unison.....How'd THAT happen ? The Time is NOW....to WAKE UP ! Also....if all of these 'super Blacks' were actually sincere about seeing the needs of Black America being addressed (which there are many)...they would be (and would have ALWAYS been) focusing their attention/efforts to the Congressional Black Caucus, which is the group of Black politicians in D.C. created over 40 years ago under the auspices that THEY would create legislation needed to address Black needs. But what exactly have THEY done ? Absolutely NOTHING ! Since we did not elect a dictator, it is important to remember that true change comes through the legislative process, meaning Congresspeople and Senators drafting and passing bills that address our needs and concerns. The President DOES NOT write legislation....he simply passes or vetoes bills already passed by the Congress. So MOST times when we hear the whiny phrase...." Obama should...."....the FACT is....9 times out of 10....OBAMA CAN'T ! That's NOT how the process works (civics 101). So for those who ARE sincere and DO want to see TRUE changes implemented for a Better Tomorrow for ALL...time to place your focus on the correct target....which is the legislators....the Senators/Congresspeople....the CBC (for Black issues). In other words....West, Smiley, Pro-lefties, whacky 're'-gressives and company should ALL place the blame where the blame is truly due...because when they don't....they simply expose themselves as ignorant to the process (of which we'll gladly help to educate them) or just another Obama-hater...of which they WILL be exposed.